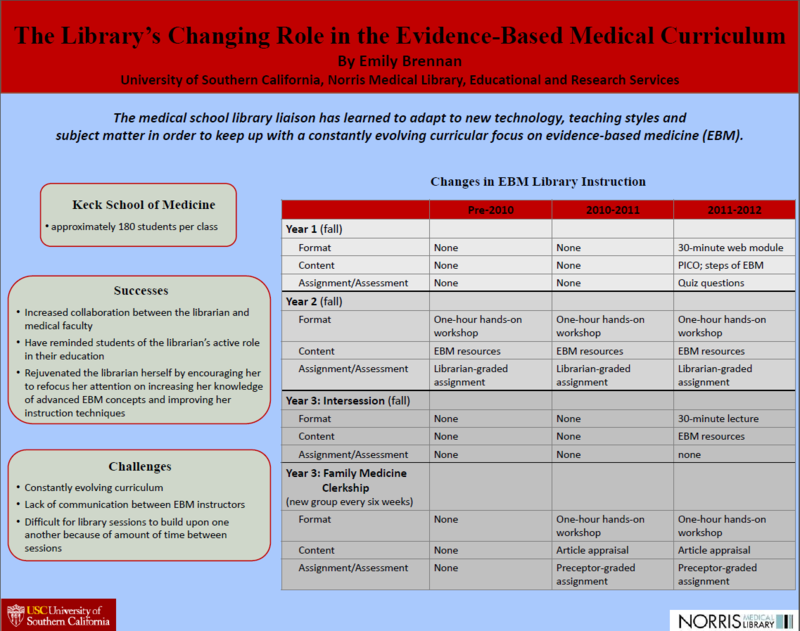 Virtual Poster 8: The Library’s changing role in the evidence-based medical curriculum. In order to keep up with a constantly evolving curricular focus on evidence-based medicine (EBM), the medical school library liaison has learned to adapt to new technology, teaching styles, and subject matter. Until recently, only year two students received librarian-led EBM instruction, while faculty-led EBM was sparsely integrated into the curriculum. Librarian sessions included testing while faculty-led instruction did not. Now, the library provides EBM instruction to students throughout their first three years, and develops and grades assignments to reinforce learning. The librarian produced one of a series of web modules introducing basic EBM concepts to first year students. Students are tested on the content. Year two students attend a one-hour workshop and complete a librarian-developed and graded assignment based on the workshop’s content. Year three students receive a review of EBM resources by way of a librarian lecture in order to reinforce EBM concepts before their clerkships. The librarian further solidifies advanced EBM concepts during the third year Family Medicine clerkship with a hands-on workshop and preceptor-graded assignment, which moves EBM from an abstract concept into clinical practice. Curricular changes have led to increased collaboration between the librarian and medical faculty, and have reminded students of the librarian’s active role in their education. Furthermore, the evolving EBM curriculum has rejuvenated the librarian herself by encouraging her to refocus her attention on increasing her knowledge of advanced EBM concepts and improving her instruction techniques.